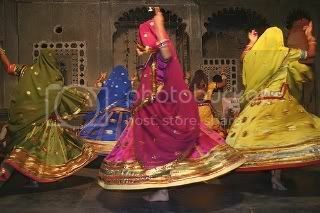 In Rajasthan, music plays a very important role in the life of the people. One of the finest folk music in the world, its rhythm, melody and diversity will fascinate and mesmerize you. The real folk song is not something to be read where the lyrics are read in a prosaic style. The real folk-song is not something to be read. 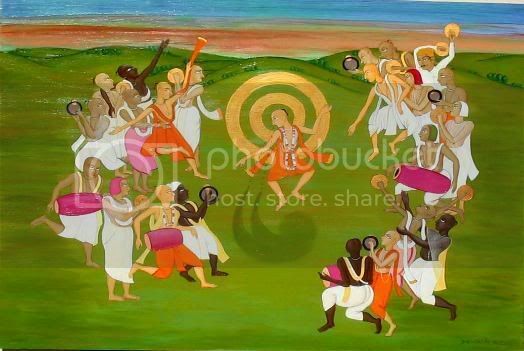 The themes revolve around love, separation, heroism, patriotism, nature, seasons, festivals, rituals, customs and daily lives. The lyrics expressing the mundane, is also medium to reach the divine. The people of Rajasthan live life to the hilt. After hard work in the harsh desert sun and the rocky terrain whenever they take time off they let themselves go in gay abandon. There is dancing, singing, drama, devotional music and puppet shows and other festivities, which transform the hardworking Rajasthani into a fun-loving and carefree individual. Each region has its own folk entertainment, the dance styles differ, as do the songs. Interestingly enough, even the musical instruments are different. 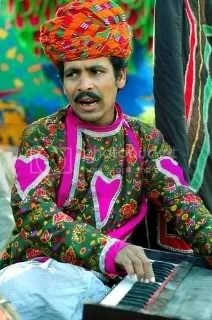 The most widely used ragas in Rajasthani folk songs are Mand, Bilawal, Kafi, Desh, Khamaj and Peelu. Some are in their pure forms and others in combinations. The folk songs nurture an element of Indian classical music knowing no rigid rules. The exclusive contribution of Rajasthani music to the classical music of India is Mand which is well recognized in classical circles. Rajasthani music makes use of six, seven or eight matras of Tal on the dholak, tabla and nagara. Madal, mridang, changri, naubhat, dhumso, dafra, khanjari, dhibko, apang, matki and damru are the other Tal instruments. The musical instruments used with folk songs help to keep the taal for the effective rendering of the music. These range from the soft tinklers to thunderous kettledrums, from simple flutes to fascinating trumpets. The Ravanhattha, Ektara and Sarangi are the stringed instruments used with folk songs. The Kamaichi is another stringed instrument with twenty seven strings. Its shape is quite different from the Sarangi-Veena. It is worn round the neck and played in standing posture in certain areas of Mewar. The Rawaz is another instrument used by the Raos and the Bhats in Mewar. It has twelve strings and is played with a nakha instead of rod. There is a variety of instruments played by the mouth including the bansuri, algoza, satara, shehnai, toto, pungi, nad, bankia, conch and singi. Songs sung by women, are mostly about water and is cantered around the well, the style is called ‘Panihari‘. ‘Gorbund‘ is a famous folk song which depicts the process of preparing a decorative string for a camel. The other folk songs are ‘Indhani‘, ‘Lawarji‘, ‘Jallo‘, ‘Hichaki‘, ‘Olyun‘, ‘Sapno‘, ‘Kurjan‘ etc. Songs, laden with religious flavor, are sometimes folk idioms of saints, Surdas, Kabirdas, Meerabai and others. In the ballad tradition, minstrels sing and narrate heroic tales of folk heroes like Tejaji, Gogaji and Ramdeoji and even of legendary lovers and their tragedies. 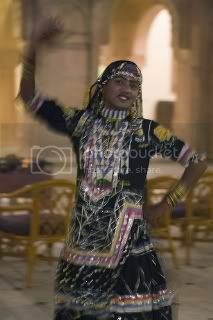 Rajasthan has a number of communities whose hereditary profession is to sing to entertain people. Music traditions are kept alive by entertainer communities like the Langas, Manganniyars, Mirasis and Dholis. Professional performers like the Bhaats, Dholis, Mirasis, Nats, Bhopas are omnipresent across the state. They are patronized by the villagers who participate actively in the shows put up by these traveling entertainers. The education of music in these groups begins early and is passed down from generation to generation. The folk musicians are expert in hindustani classical tradition too. 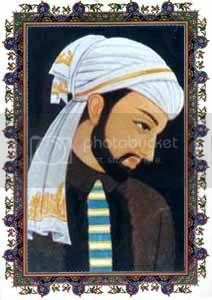 If there was one single person who could be credited with influencing hindustani classical music the most, it undoubtedly is Amir Khusrau (or Khusro) (1253-1325). He was a sufi saint, darvesh, philosopher, devout disciple, linguist, historian, warrior, inventor, a naughty humorist, lyricist, singer, musician and poet par excellence…the list is endless. Amir Khusrau, one of the most versatile personalities of medieval India, was born in the year 1253 in a place called Patiyali, Uttar Pradesh in India. Also known as Amir Khusrau Dehlavi, this creative classical poet was associated with the royal empires of more than seven rulers of Delhi. Known for his immense contribution in literature and music, this legendary personality was born of a Turkish father and an Indian mother. He lost his father at a young age and then moved in with his maternal grandparents. His grandfather served as an attendance master of soldiers at the royal palace of emperor Ghayasuddin Balban. Khusrau was exposed to all famous literary figures of his time when he accompanied his grandfather to the royal courts to attend the private congregations. This inspired him to take up poetry and indulge in fine arts like music. He also learnt horse riding and received training in martial arts. The famous Sufi saint Hazrat Nizamuddin Auliya was his spiritual mentor. 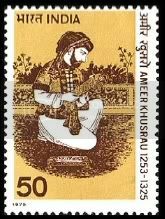 Amir Khusrau is often acknowledged for creating ‘Khayal‘ of North Indian Classical music (popularly known as Hindustani Classical Music). He modified Dhrupad and added Persian tunes and beats to it. He created Qawwali on the likes of Bhajans. The poems he wrote were in Persian and a combination of Brijbhasha and Persian, which he called as Hindvi. These poems later were developed into Hindi and Urdu. 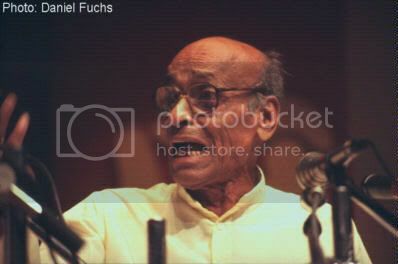 Many of his poems are even today used in Hindustani Classical as Bandishes and as Ghazals by Ghazal singers. Amir Khusrau is credited with fashioning the Tabla as a split version of the traditional Indian drum, the Pakhawaj. He is believed to have brought Sarod into the mainstream hindustani classical music. Popular lore also credits him with inventing the Sitar. Note : The above sound files belong to Government of India archives and are of lo-fi (mono) sound quality !! 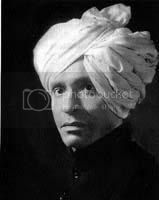 Mallikarjun Mansur was born on December 31, 1910 in a village in Dharwad district of Karnataka. He had four brothers and three sisters. His elder brother Baswaraj had his own theatre troupe. At the age of nine, Mallikarjun played a small part in a play. The experience fascinated him so much that he ran away from home and joined a touring drama troupe. Although his father brought him back home, the stage continued to fascinate him and he soon joined another touring theatrical company. It was through the initiative of a friend that Ustad Manji Khan of the Jaipur Gharana, noticed Mallikarjun. Already trained in the Gwalior style, Mallikarjun was able to absorb the rich Jaipur style. The virtuosity of the Jaipur Gharana was more evident in his style. He could cast a hypnotic spell on his audience with his astounding breath control and the absolute purity of his swaras. There was always a special intensity to his singing, a special urgency and earnestness in his treatment of melody. The most memorable among his early concerts was the Ganesha Utsav concert in Mumbai, in which he sang for over six hours. In 1932, after a special audition by HMV, he cut his first gramophone record. But although he had made several discs for HMV when he was still in his early twenties, music did not become a paying profession to Mallikarjun until much later in life. Mallikarjun had always led a simple life. So many of our well known artists move about with a swagger for they seem to believe that they are indeed the colossi striding the scene. Mallikarjun did not possess a regal bearing. He did not clothe himself in princely robes. He did not care to be the center of attraction. He continued to look like a shopkeeper’s accountant. He rarely referred to his triumphs. He won not only the respect but the affection of his contemporaries. He was wholly without envy. His airs were what he sang. He did not put on any. Struck by lung cancer, he died on Saturday September 12, 1992. 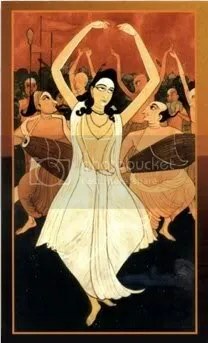 Now, whenever I listen to Trance music which I do quite often, it always reminds me of the similar psychedelic effect that the Kirtans or for that matter the Qawwalis of our sub continent produce on the listener. By repeating simple mantras over and over, faster and faster, the kirtan is an easy way for people to experience some freedom from the daily chatter of the mind. And while it is true that we can sing these chants in the solitude of our own home, there is nothing like the magic of chanting live with musicians and hundreds of participants – from kids to seniors – all adding their energy to the chant. People often say they feel ‘buzzed‘ for days following such a chanting experience. So what gives us that buzz ?? Something about the kirtan experience goes beyond the music itself, goes to a deeper experience of vibration. We all resonate at different frequencies, and these frequencies change according to what we are doing and thinking. So when we are all doing the same thing – chanting, breathing, and moving to the same rhythms – our vibrations begin to synchronize and the resulting experience is very powerful. So even if you’re having a truly rotten day, it may be difficult to hold onto those feelings during the chant experience. If you were only to sit in the room without participating, the idea is that you could still feel the shift. Something happens – the energy begins to activate the spirit that exists within us all. Although the kirtan involves music, the underlying art of kirtan chanting is not actually about musical ability or training – it is about the heart. Everyone can participate, regardless of age or cultural background. The purpose of this music is to get us out of our heads and into our hearts. Typically, the songs can last for 20-30 minutes each with a few moments of silence in between each song so you can soak it all up. The longer songs allow for deeper experience of the effects, and with the simple, repetitive lyrics (it’s a chant, after all !!) we really don’t have to think much about the words. In fact, because the ancient Sanskrit lyrics are not familiar to many of us, these words take us away from the mind’s constant chatter a little easier. The powerful healing and transformational energies of these ancient chants can help to reconnect us to the Ever-Present and Eternal Being that lies within us all. All the mantras, melodies, and instruments of kirtan are designed to lead us toward this meditative state. We provide floor seating in the traditional style of kirtan events in India (and yes, we also provide chairs for those who prefer chairs), and this living-room style music experience allows people to sink into themselves, to relax and ground themselves during the chants. Most of us spend the day in our heads, running here and there, thinking about where we have to be and what we have to do next. The kirtan gives us a time to come back to our center. And when this happens, beautiful things begin to unfold. Feelings of inspiration, peace, and a sense of connectedness are common experiences. Kirtan helps the mind become quiet, and when the mind quiets, we can begin to perceive the mystical things, the sacred experiences, that are around us always. In the silence between the songs, when the song stops, you can feel something. And that something is you. There is no greater experience than the experience of one’s Self. And that vibration is always within you, that vibration is you. That’s the beauty of any chant experience – with little or no effort we can experience and enjoy the vibrations of peace, energy, healing and inspiration that are always within us. Listen and live in peace ! !